Months ago I bought a pack of the Silhouette Window Cling material and it's been waiting in the drawer for a tutorial and review since. 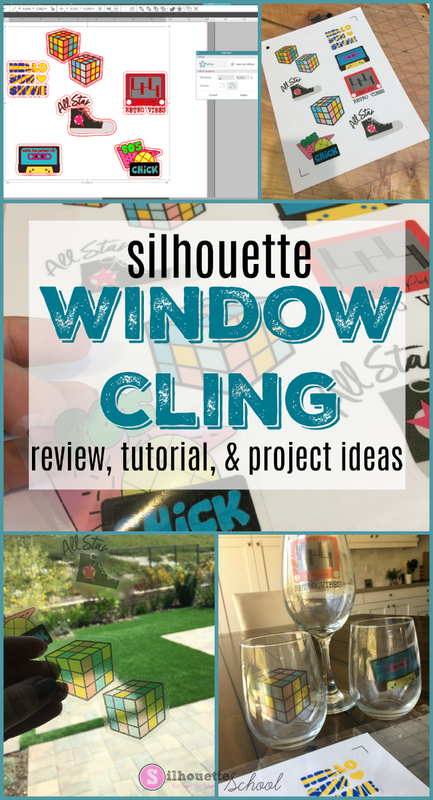 Finally I dug it out and now I'm here to give you a review of the Silhouette Window Cling and quick and easily Silhouette tutorial on how to use this stuff to make your own window clings. This material doesn't get the greatest reviews on Amazon, but I wanted to see for myself. Pretty much any design that's print and cut friendly can be used to with the Silhouette window cling sheets. They're essentially just like stickers or temporary tattoos. 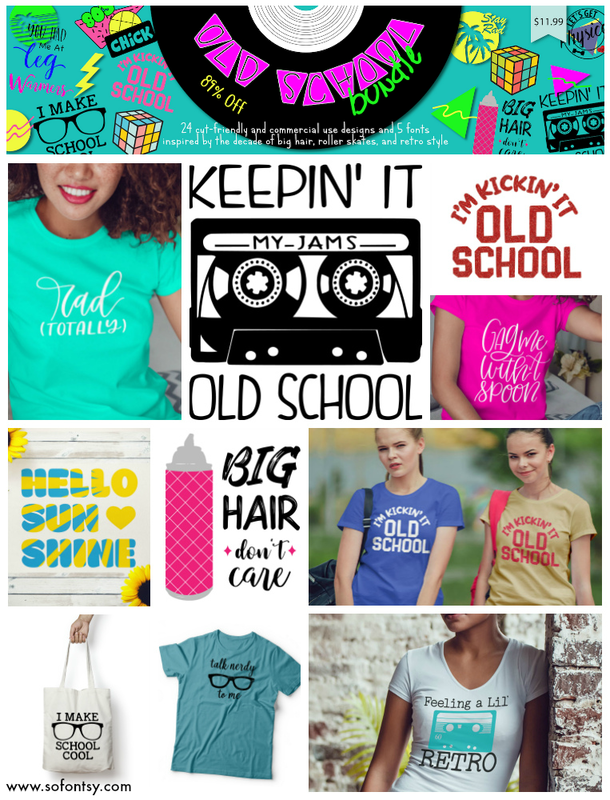 I am working with a few of the retro and 80's designs from So Fontsy's Old School bundle (which expires 5/22/18...yikes). 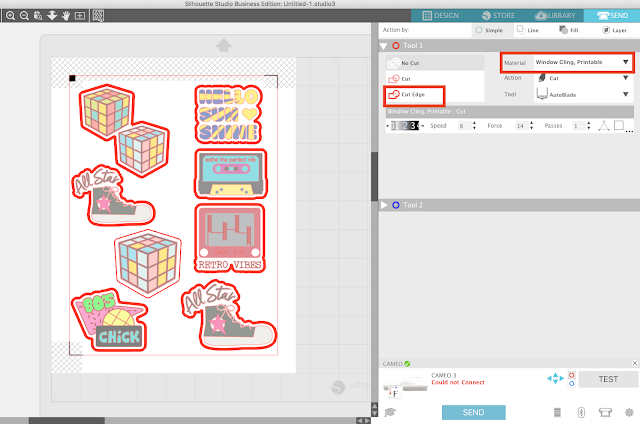 The first thing you want to do is open up a blank work area in Silhouette Studio and drag in or merge in your designs from your library. I would suggest you size them first by using the Scale tool (found in the Transform tool). 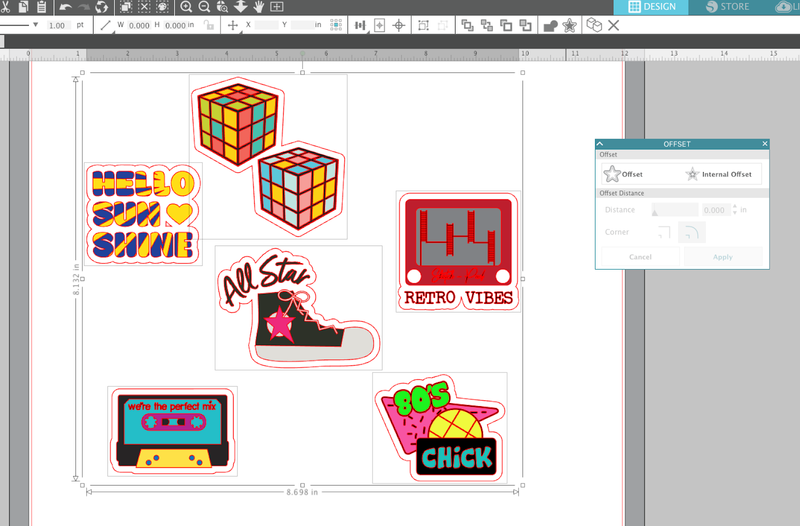 You can also select each design and pull the corner nodule in or out to size the design to your liking. Next open the Offset panel and with all of your designs selected click "Offset". Change the offset distance if necessary. You're looking to make sure any text has a large enough offset or border around it so the window cling cut as a solid piece. Click "Apply" when the offset distance is how you want it. Any overlapping offset lines will automatically weld. Now open the Page Setup Panel and change the page size to "Current Printer." You'll also want to check the box to Show Print Area. Be sure to turn on your registration marks as well. You can do this by clicking "M" on your keyboard or by going to the Registration Marks tab on the Page Setup panel and picking "Type 1". 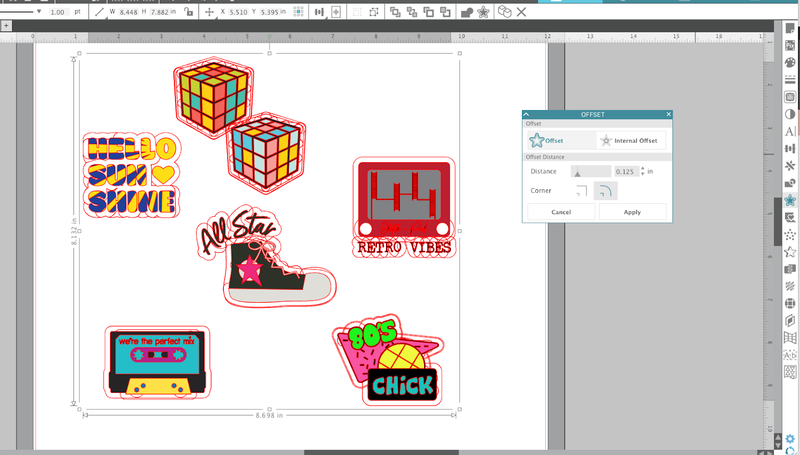 Arrange the designs so they're not touch each other or the registration marks or hashed areas and so they're all inside both the print border and the cut border. Move to the Send panel and with all of the design selected click "Cut Edge". This should turn on a bold red cut line on the offset line ONLY. You do not want the actual design cutting. Load the Window Cling material into your home printer with the shiny side oriented so it will be printed on. 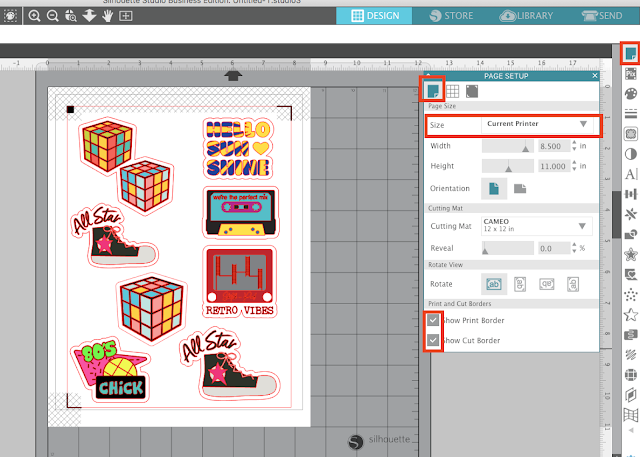 From Silhouette Studio, click the Print icon along the top tool bar. I found that the print quality was good - not great. The colors were a little "dotty" and muted especially compared to how they printed on paper. Also keep in mind your printer won't print the white areas on this window cling so you'll need to either change the color, turn on the line to define the area, or get the Silhouette white window cling sheets. When the print is finished, place the printed window cling sheet on the Silhouette Cutting Mat and load it into the cutting machine. Return to Silhouette Studio and from the send panel, select Window Cling as the material. Click "Send" to begin the cut. The default cut settings worked perfectly. When the cut is finished make sure your can peel up one of your window clings cleanly before uploading the full mat and sheet from the Silhouette cutting machine. This way if you need to re-send the cut again, you can do so with no fear the cut line will be off. The great thing about the printable window cling material is while they're fun for windows and sliders (I had no issues with them sticking, rolling, or peeling as some of the reviews mentioned), they can be used other ways as well. ...and when the party's over, just peel them off easily, place them back on the window cling sheet and you can re-use them. Plus, there's no sticky residue left behind on the glass. It is important to keep in mind that these aren't a static cling material - they do have adhesive on the back. But the adhesive doesn't get left behind when you peel them off or move them. which also cost me to buy your book another waste of money. Your school as you say is just a way you get customers to spend needless money making you rich. Hi Summer, I'm not exactly sure what you are referring to. Silhouette America runs a subscription program for mats and blades. This blog, Silhouette School Blog, is not associated with Silhouette America. 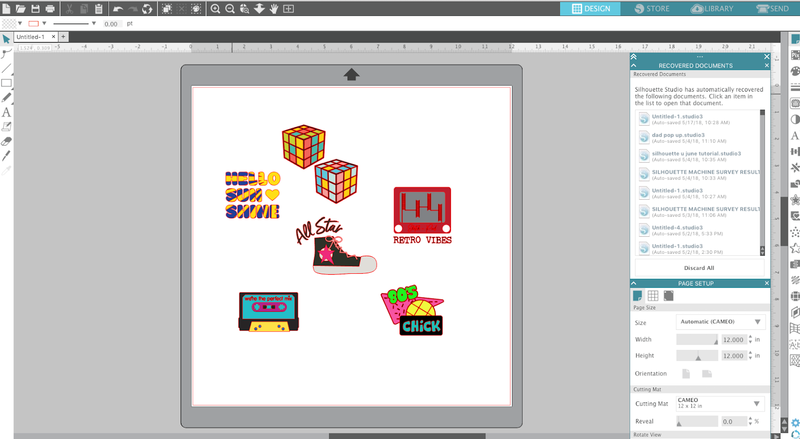 This blog is a free resource that I offer to anyone who would like to read it and find out how to use their Silhouette cutting machine, software, and read related product reviews. There is no cost to read the more than 1100 blog posts and tutorials. I can't speak for Silhouette America's customer service, but we answer every email that comes through our inbox within 24 hours - and there are a lot. I love the window cling! I have these great windows in my den that are floor to ceiling and on Halloween(also my birthday) I did a ton of black bats in about three sizes and it looked like a large group coming in. At Christmas time I did a bunch of different snowflakes and even a snowman. I just bought red for Valentine's day and green for St. Patrick's Day. Also Orange for Halloween to go with bats. I am a big holiday person. I have had no problems with the window cling and love it!